Poli-Seal is the ultimate All In One product (AIO) that is arguably the best value in detailing! There are plenty of AIO type products out there but few if any can do what the Optimum Poli-Seal can do. This amazing product has some of the best chemical cleaning agents, fine polishing particles and polymers ever put in one products. So you may be asking what does this all mean? The chemical cleaning agents will help safely remove contaminants for a cleaner and more reflective surface. The ultra fine polishing particles help permanently remove, not just temporarily hide, imperfections in the paint. This step makes the clear look and feel very smooth which allows you to get that extra deep reflection. Lastly the coating of polymers leaves behind a mirror like shine that hugs every inch of your paint! You can expect an eye catching shine and strong polymer protection for months to come. You can apply the Poli-Seal by hand or with a buffer, which is a very easy to use product. Apply this product every 3 - 4 months to maintain a new finish and total protection of your vehicle. Note: As of 2018, Optimum introduced a new and improved version of Poli-Seal. This new version has virtually no dusting, looks great and lasts even longer! Most users of this product are looking to maximize time, energy, and efficiency. While there are other 1-step products available, none are zero dusting other than Optimum Poli-Seal. And let's face it, when time is key, you don't want to have to go back and blow dust out of crevices, rewash, or have to clean up a Sweedish Chef looking work area. Optimum Poli-Seal is the most remarkable, all-in-one product ever produced! This zero dusting, buttery smooth formula is the ultimate, one-step product. It creates gloss and long term protection that is second to none. 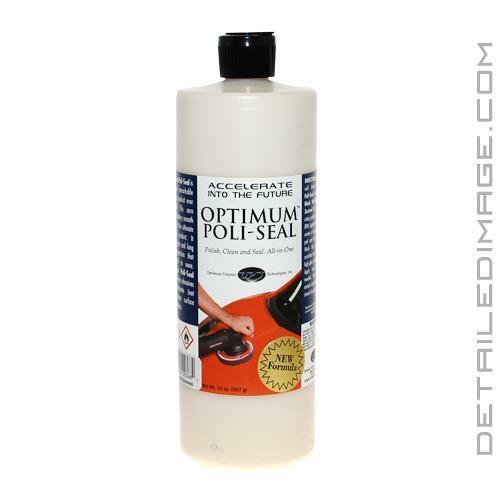 Optimum Poli-Seal contains micro abrasives that eliminate (not hide) minor surface imperfections. 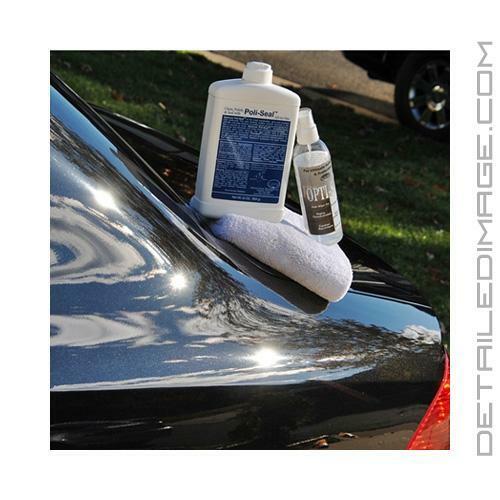 It provides swirl mark removal, the final polish and a durable wax/sealant... all in one step! Poli-Seal created a perfect shine on all types of paint, fiberglass, gel coat and smooth molded plastic. A single application provides "optimum" protection for your vehicle that lasts for months! Hand application - Apply to a small area with a dampened foam or cloth applicator. After slight hazing occurs, wipe-off with a microfiber or terry towel for a perfect shine. Machine Application - Apply with orbital or rotary polisher and appropriate pad for the job. Apply just enough product to create a lubricated barrier between the rubbing pad and the surface. Work across the area until the product disappears. (We suggest 1000-1400 rpms for rotary polishers.) Wipe with a lightly misted cotton towel for a streak-free, perfect finish. For more serious surface imperfections. use Optimum Polish or Optimum Compound prior to Poli-Seal. Great product, used it as my quick detailer and it is a great aio. It will be a mainstay in my arsenal. Not sure how anyone can have bad things to say about this product. I have been using this stuff for years and its nothing short of outstanding. It has great correcting ability for an AIO and it leaves a very deep wet finish. This stuff goes on so easy and comes off even easier. I couldnt live without it. Its in a class all its own. Its a must have for everyone. Great for soft and hard clearcoats.